In 1869, the voters of Virginia approved a new constitution and a year later the state was readmitted into the Union. In addition to granting African American men the right to vote, the new constitution mandated that the state maintain a system of free public schools. Access to education was especially important to African Americans, who were among the free schools' most vocal advocates. Although not required by the 1869 constitution, the state's public schools were segregated by race. In an environment where black education was often seen as unimportant, African Americans fought for more school buildings, longer school terms, additional years of instruction for their children, and control of their own schools. And, over time, in black schools as well as white ones, the teaching profession became, predominantly, the province of women. In post-Reconstruction Virginia, whites often served as teachers in black schools. Some, like Elizabeth Cartland, were committed to working with freedmen; others were incompetent pedants who were unable to get jobs in white schools. (Teachers, however poorly paid, did receive a salary, and salaried jobs were scarce in economically ravaged postwar Virginia.) In some areas, African Americans had little choice but to accept ineffectual white teachers, as there were few qualified blacks to fill positions. Beginning in the late 1870s and early 1880s, however, African Americans in several localities around the state began to push for the replacement of white teachers in black public schools. In the years since the Civil War, they argued, many African Americans had become qualified to teach, and jobs (and salaries) in black schools should be reserved for black teachers. Black parents believed that black teachers had a better understanding of the educational needs of their children. In the wake of Readjuster electoral successes, in 1882 thirty white teachers in Richmond public schools were replaced by African Americans. By 1900, black teachers had replaced whites in almost all the South's rural schools and most of the urban ones as well. During the first decade of the twentieth century, new ideas concerning education began to take hold, and these ideas cut across racial lines. One-room schools were combined or "consolidated," allowing for age-appropriate instruction. School terms were lengthened. Public money was made available for the establishment of high schools, provided they became accredited. By the time this photograph was taken in 1909, teaching had become a profession—one of the few open to significant numbers of black women." However, local school boards demanded that female teachers demonstrate modesty and decorum at all times, and women generally lost their jobs if they got married. Like much of the rest of society, school boards assumed that a woman's husband would provide for her, believing that teaching jobs should be reserved for those who needed to earn a living. School administrators also were concerned that married female teachers might become pregnant. Although we do not know when Leonie Holmes left teaching, she may have done so when she got married. In this photograph, Leonie Helen Holmes holds a diploma while a second, framed diploma sits at her feet. The diploma on the floor is her diploma from Richmond Colored Normal and High School; the one in her hand is probably a diploma from a six- to eight-week summer "normal"—a special program designed to train teachers. Summer normals were instituted around 1906 as part of the state's efforts to reform public schools by establishing standards for teachers. 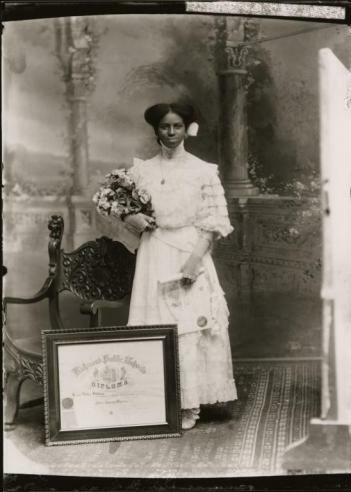 Leonie Helen Holmes graduated from Richmond Colored Normal and High School in 1909. The school served as both a secondary school and a teacher-training academy. It was the forerunner of Armstrong High School. As the background suggests, the picture was taken in a photographer's studio. Several photo galleries in Richmond, including Foster Studio, served a racially mixed clientele. Another was operated by J. C. Farley, a black photographer who was no longer active at the time this photograph was taken. George Brown, who had once partnered with Farley, opened his business in 1909, which eventually became the best-known studio in Richmond's Jackson Ward. Why did Holmes choose Foster instead of a black photographer? It is possible that this picture was taken during the brief period when there was no black photographer operating in Richmond. It is also possible that the Holmes family and Foster knew one another. Of course, it could also be that the Holmes family chose Foster because they liked his work. Walter Washington Foster established his first photography studio in Richmond around 1876. Over the next several decades, Foster worked in partnership with a number of other photographers before going into business with Arthur W. Orpin, who eventually married Foster's daughter. Orpin left his father-in-law's employ in 1921 and was replaced by Anthony L. Dementi. Three years later, Dementi left the studio and was soon in business for himself. The Foster and Dementi studios competed with each other for more than forty years. When W. W. Foster died in 1935, his business passed into the hands of Arthur Orpin. Later, it was passed down to Orpin's son, W. Foster Orpin. In 1972, the Foster Studio merged with Dementi, which was still run by its founder. At that time, the photographic archives of the Foster Studio, consisting of 65,000 images and 100,000 glass plate negatives, was turned over to the Virginia Historical Society. Foster and his partners were commercial photographers. Consequently, the images in the collection do not document an era or provide social commentary, but rather they reflect the choices of paying customers. However, knowing that the family of Leonie Helen Holmes paid Foster for this portrait tells us something about their status and their values. The subject of this photograph, Leonie Helen Holmes, was born on January 1, 1891 and died on September 11, 1985. She was eighteen years old when this photograph was taken. According to family members, Leonie Holmes married W. S. Watkins, who established a funeral parlor in Richmond. She helped her husband open the business, which was initially located on 619 Brook Avenue, in the heart of Jackson Ward. According to her grandson, W. S. Watkins III, Mrs. Holmes was a sweet woman with a quiet disposition. She and her husband eventually divorced, although they remained close throughout their lives. She was a lifelong member of Moore Street Baptist Church. Her niece, Ramona Holmes, remembers visiting her aunt at her home on Hancock Street and brushing her long, beautiful hair. Have your students examine the picture closely. Ask them to describe it. Can they guess where it was taken? When? Tell your students that the subject of the photograph is Leonie Helen Holmes. Ask them to look closely at the expression on her face. Can they tell how she feels? Ask your students why they think the picture was taken. Point out the two diplomas and explain what they are. As an eighteen-year-old beginning her teaching career, what kind of challenges would Holmes have faced? Tell your students that W. W. Foster, the photographer who took this picture, was white. Why do they think the Holmes family chose to patronize a white photographer? Why do they think Foster chose to provide a service to a black client? Remind your students that Leonie Helen Holmes was both black and female. As an African American living in Virginia in the early 1900s, what challenges did Holmes face? As a woman living in Virginia in the early 1900s, what challenges did she face? Can your students think of other black women who have faced similar challenges? Ann Field Alexander. Race Man: The Rise and Fall of the "Fighting Editor" John Mitchell Jr.
Sara B. Bearss and Patricia D. Thompson. Foster's Richmond. Adam Fairclough. A Class of Their Own: Black Teachers in the Segregated South. William Link. A Hard Country and a Lonely Place: Schooling, Society, and Reform in Rural Virginia, 1870–1920.